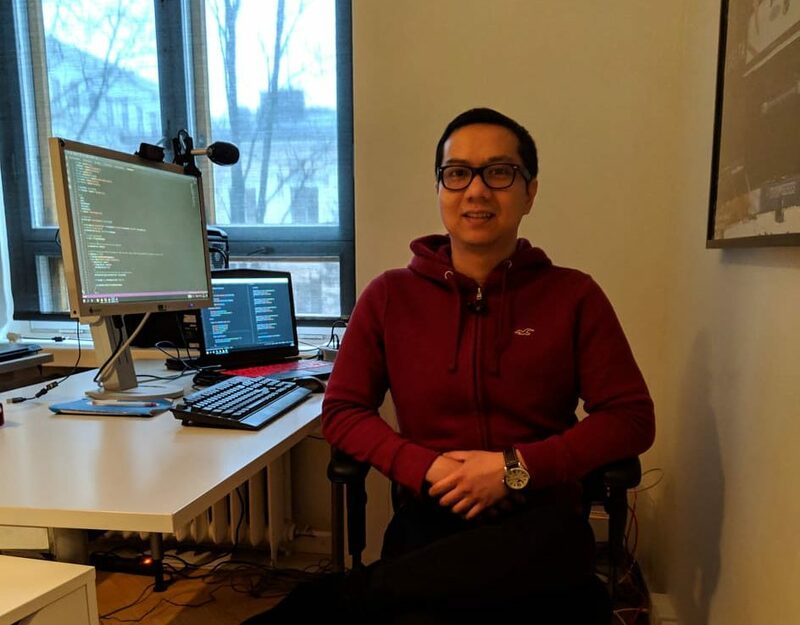 Marco joined SPICED in 2018 and, since graduating, has moved back to his adopted country of Finland to take a job as a Full Stack Web Developer at Uplause. Here he tells us about how he went from the world of nursing to the world of tech. Tell us a little about your life before SPICED? I grew up in the Philippines as the youngest child of five. We were not rich but my parents worked hard for us to have quality education. After graduating from a nursing school in the Philippines, I set my sights on moving abroad. That was my dream ever since I was able tie my own shoes. That dream of mine came into fruition when year 2012 I moved to Finland to practice my nursing profession. I was in the healthcare field for over 10 years and, after a while, I began to feel that I was stuck. Initially, I didn’t want to be a nurse but back then it was the fastest ticket out of the Philippines (don’t get me wrong, Philippines is very beautiful country). Secondly, I didn’t grow personally and professionally, I was doing the same thing over and over again. What made you want to learn to code? I was just awed by the possibility to create endless things by just writing something in a notepad. I was always curious on how computer games work, how websites are built, how software are programmed. My mind set has always been that coding is not rocket science and if other people can do it, I can also do it, maybe better. When and why did you move to Berlin, and what did you make of it? Berlin is very different. I’d been there prior to my coding bootcamp experience and I really liked it. People are very open and basically you can just be whomever you want to be and people will not look at you and roll their eyes. People are nice and friendly and they’re pretty laid back as well. Even if it’s very international, Berlin still has its own identity when it comes to their culture and food (be sure to eat some STRUDEL! Yeah it’s Austrian but who cares!). It’s the only place I’ve been to that has something for everybody. Before starting SPICED, what were your biggest fears and how did you overcome them? In medicine we have this thing called desensitisation. For example, if you are in need of a medicine which you are allergic to, at first you will be given that medicine in small doses until your body gets used to it. Overcoming fears are the same but much easier to manage. I overcame them by doing things I thought I couldn’t do. If you think of it, fears are just limitations and illusions that are created by your mind. What did being a “coder” mean to you before the course? What does it mean to you now? Before, my idea of a coder is like being a geek/nerd who always stay in front of a computer and tries to solve real world problems to help the society, the same society that in some ways neglected them. This has changed a lot now. Being a coder is way cooler and sexier than that. Which profession has the coolest and cosiest offices? Where can you find a workplace where it’s for you to decide whether to work at a table, on the couch, a standing desk and yeah even work while having a view of the beach during sunrise while drinking your favorite coffee? I’ve been with a lot of people and believe me, coders are the people you want to hang out with come party time. What have you learnt about yourself during your time at SPICED? CARPE DIEM! In the end, I learnt that I can achieve anything as long as I dedicate all the time and effort I have. I found something that I really like doing and can be good at, so I seize the moment and opportunity and used it as my motivation. The most difficult part was the first 2 weeks. I did prepare for the bootcamp but still I found it hard and literally when I go to sleep, I was dreaming of CODING! The biggest challenge I had was solving complex problems. Sometimes I was more focused on solving tasks and getting the answer that I forgot in the first place that problems are there for you to learn something. Coding is difficult at best and that’s the beauty of it. Now you’ve finished at SPICED, what are you up to? After finishing my SPICED adventure, I went back here in Finland to continue my studies. I am also working as a full time software developer in a Helsinki based fan engagement company called Uplause. What advice do you have for people who are thinking about making a career change and thinking about attending a coding bootcamp? Coding can be learnt by anyone but it is not for everyone. Ask yourself a lot of questions. If you want to be a coder just because you want to earn money then it’s not for you. The advice I always give to people if they ask me if coding is for them is watch a couple of tutorials or, better yet, enrol themselves in an online learning platform like Udemy. If you find it fun and difficult at the same time, then most probably coding is for you. Once you decide to learn how to code, give it 100%. Expand your social circle. Look for mentors that will guide you in every step that you make. Surround yourself with people who know better than you and the learning will take care of itself. I admire developers that learnt on their own. However, not everyone is capable of teaching themselves and that’s where a coding bootcamp comes in. The best thing about a coding bootcamp is that you will learn how to code with like minded people who has about the same level of experience as you are and develop a special bond with each other. You will never run out of something to do, which means the knowledge and skills you will acquire is enormous. You will be stressed out, frustrated, tired, exhausted and all the other negatives that come with intense hard work but at the end of the day, saying ‘I learnt a lot’ is an understatement for SPICED. Never settle for less than what you think you deserve, and believe in the beauty of what you can do. Want to spice up your inbox?